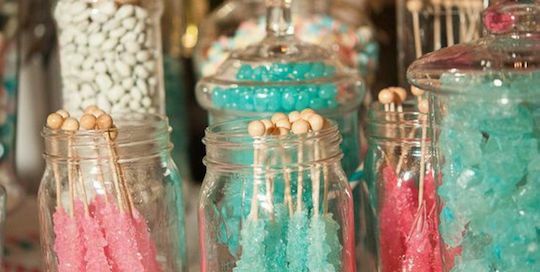 We sought out the best wedding planners to get the skinny on how to create the ultimate candy buffet for weddings, birthday parties, graduations, baby showers, sweet 16’s and quinceaneras. Get ready to unravel the secrets of how to create the ultimate candy bar that will wow your guests and save you hundreds of dollars. 1. 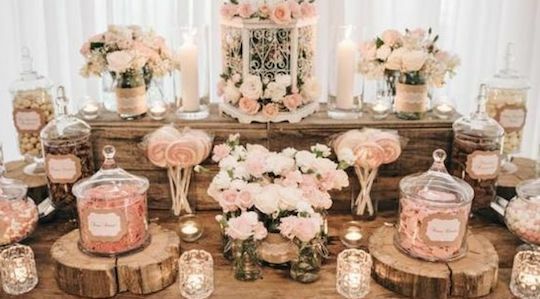 What DIY ideas can you provide for choosing a good table and linens for a wedding or party candy station? 2. 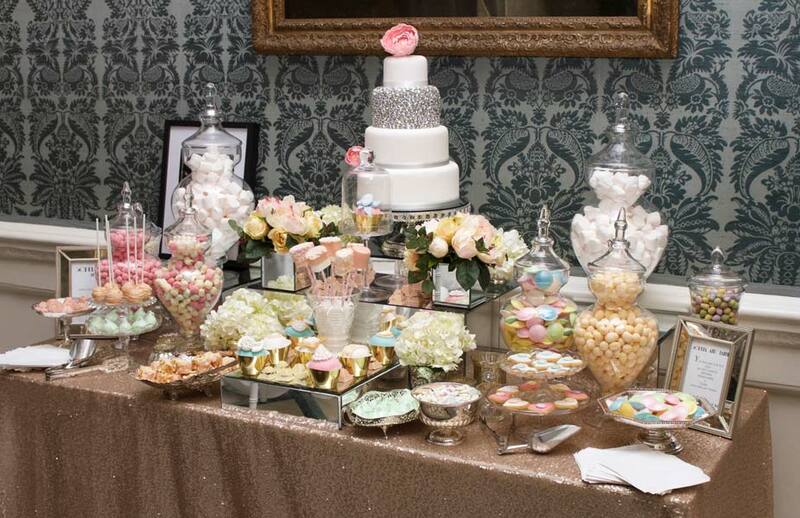 Any recommendations for great places to buy wedding candy bar display linens online? 3. What DIY tips, ideas and resources would you recommend for choosing the best scoops and glass or plastic candy jars for a candy bar? 4. Any recommendations for great places to buy Candy bar containers, dishes, vases & jars online? 5. What tips would you recommend for choosing the best candy for the buffet? 6. Any recommendations for great places to buy bulk or wholesale candy or custom mints for a candy buffet? “Rather than having a bunch of generic candy, consider having custom candy made with text or flavors that are meaningful to your relationship. 7. What recommendations would you make on bags and supplies for guests to use to fill with candy buffet candy? 8. Any recommendations for great places to buy bags online for a candy buffet? 9. Any other recommendations on creating the ultimate candy buffet? Ready to create your ultimate candy buffet? 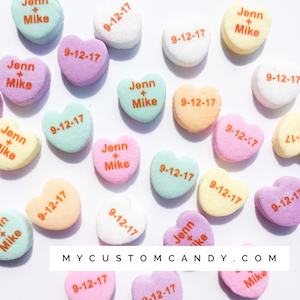 Start here with Custom Printed Candy Hearts and Mints! 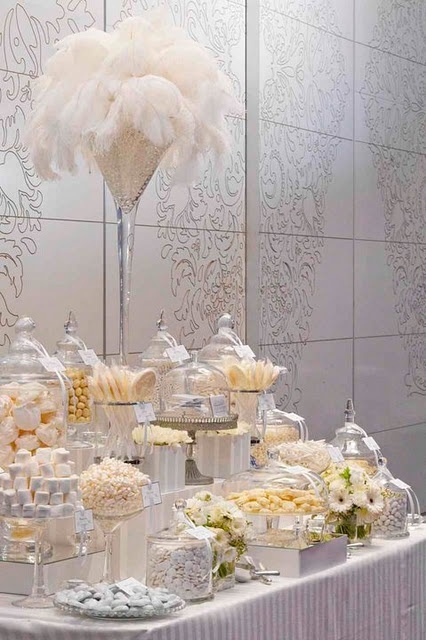 I love the idea of having a candy buffet table at your wedding. I think that guests of all ages can enjoy a tasty selection of candy. Heidi’s Hiller’s advice to choose wrapped candy so that people aren’t spreading their germs around is really smart. It would be a good idea to look for wrapped candy to match my wedding’s colors so that I can order it early. Each custom conversation heart candy can have two lines of text with up to 9 characters per line. Email us at hello@mycustomcandy.com for rush delivery (rush fee will apply).